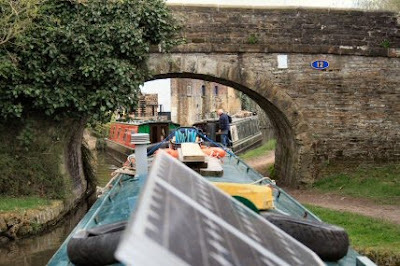 Sat at the mooring this morning I saw that Dash was sat in the bows watching something rather interesting - well to him anyway - Looking across the canal I spotted that he had his eye on a tree rat :-) and at that moment a heron flew past the window. It had been disturbed a trip boat from Portland Basin. Nice to see so close though. One of the major items of a sign of uncaredforness (is that a word or can I claim to have invented it !!) 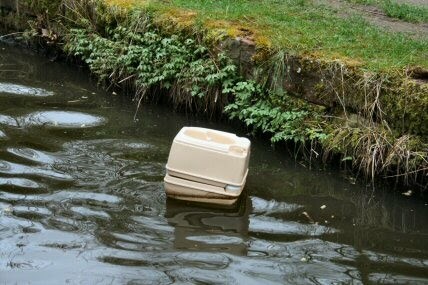 is the floating rubbish. 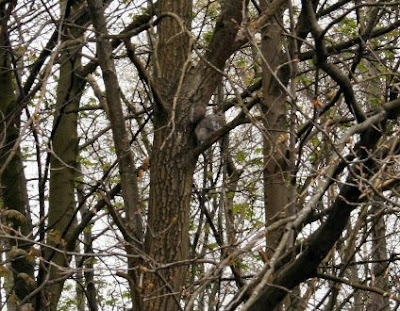 Here it is not the plastic bags that are a problem but the branches of trees that seem to be everywhere. In this instance either the person couldnt dump the cassette or buys a new one everytime it is full. 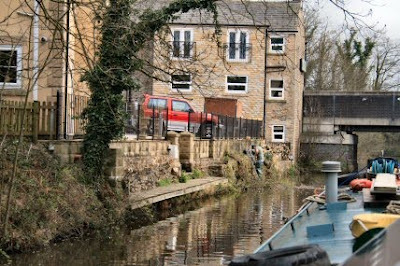 It is not just locals (unless it is from a caravan) that care not for the canal. One of the problems of the Ashton is the number of low bridges. Yet again we have to take down the wind genny to get under. Signs of the the good old days are still here. 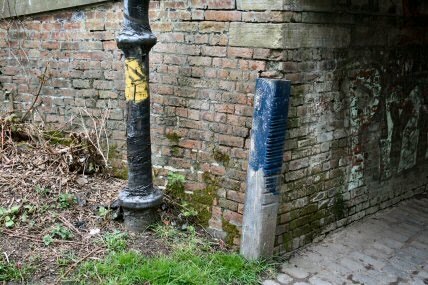 Instead of just scoring the stonework the powers that be have inserted a metal corner that is about one and half inches think to save the bridge from damage. Even so there are deep grooves in the the corners. 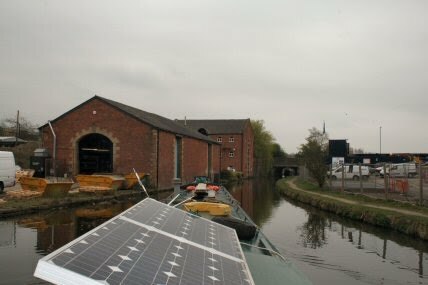 Heading for Romiley there is an area that is being redeveloped. 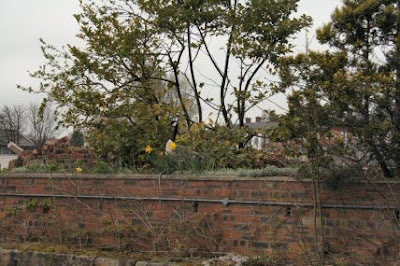 Amongst the demolition there is a wall that has flowers planted along its top and sitting in the middle is a Canada goose looking very much at home. Now and again there are old wharfs that have been given a new lease of life and looking all the better for it. Another Roving Bridge. At the last one I had to go hard astern and the prop shaft was disconnected. I ended up dragging it out of the bridge and doing a quick repair so that I could carry on. The problem is that there is no good means of keeping the prop shaft connected. Must have a chat to a boatyard. 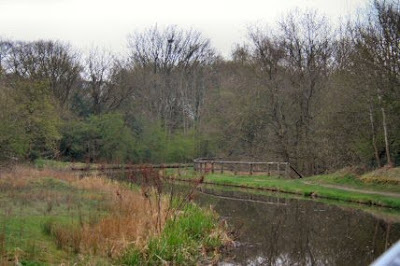 Here the canal follows the contours of the countryside. As you can imagine there are plenty of corners and not a lot of chance of seeing someone coming your way. The proof of the pudding!! At a bridge there were three of us trying to get through at once. It is such an unusual occurrence that the locals came out of their houses to look at it. Lots of bridges and ahead is the longest tunnel that we have had to get through so far. 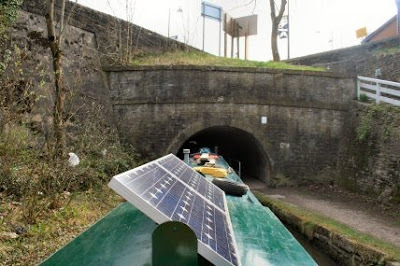 The tunnel at Woodley is 167 yards long and tomorrow there is the tunnel at Hyde Bank which is 308 yards long. 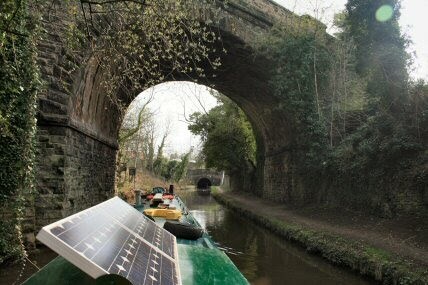 Towards the end of the tunnel I had had to alter the solar panel as the roof of the bridge gets very low on one side at the end. 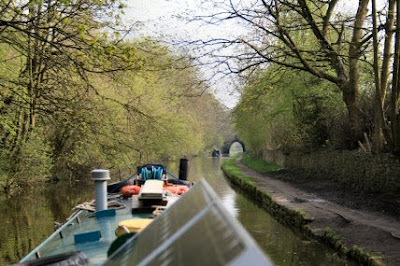 It is getting rather nice now with the trees coming out into leaf. 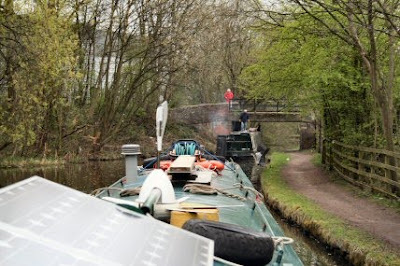 We were going to moor at the nature reserve but with the prop shaft playing up I decided it would be best to get nearer to a boat yard to get something sorted. Another hundred yards and we will moor. 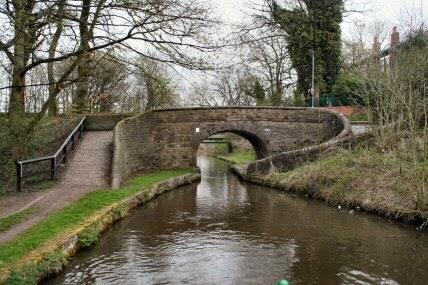 At this bridge someone is cutting the brambles etc which are growing out of the wall. The question that I must ask is where will all the trimmings go to. Will he lift them out of the cut I wonder! "!